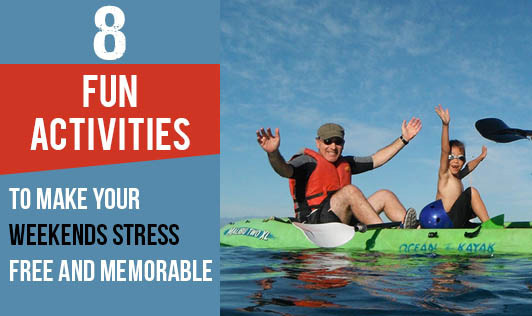 8 Fun activities to make your weekends stress free and memorable. We all look forward to the weekend but often find ourselves wondering how to spend this time in a productive and fun way. Here are some tips to get you going. Reserve some time for uninterrupted relaxation and stress relief. Shut off all gadgets while spending time relaxing, you need to take a break from checking Facebook or emails several times a day. At first it may feel strange, but as you get used to it, you´ll love it. Learn a new hobby. You have many to choose from eg: Creative Writing: You don’t need to be exceptionally good, just write whatever comes into your head., a musical instrument: Playing a musical instrument has many benefits and can bring joy to you and those around you, Try your hand at Origami: This traditional Japanese art form involves paper and skill, Draw/Paint: All you need is a pencil or crayons or paints and some paper, then let your imagination run wild. Learn a new Language: You can take up French, Japanese or Spanish etc. Try adventure sports: Adventure sports can give you an outlet for all your pent up energy you might have in you that you were not able to express.These types of sports get you excited and gives you a boost in energy and mood. Play with your children or pets: Pack a picnic lunch, Head out to the park and instead of just sitting, get yourself moving, Play Frisbee, Hide and Seek, Hopscotch, Teach your kids how to play or learn new games from them. This is a terrific way to enjoy and entertain your children and yourself. Watch something funny: . Humourous things always good for stress relief. Watch standup comedy, See a comedy movie or visit a live comedy performance. Laughter is good for your mental health and helps you to relieve stress. If you plan on watching a movie at home, keep some popcorn ready. Do something you haven´t done before: It´s easier said than done, but it is not impossible. Here are some ideas – visit a museum, enlist with a good cause, give back to the community. Discover new places in your neighborhood, hug a tree, take up pottery or a painting course or visit a planetarium. Exercise: If you exercise regularly like going to the gym or walking etc, do something different for eg. Try Yoga oraerobics. Take a zumba class or any dance lessons that suit you. Go swimming, or play a sport. This form of exercise isn't only good for your body but is good for your mind too. Visit friends and relatives: Organize to meet with friends or relatives and spend the day talking and having fun, reliving memories, and having meals together. Get a massage: Research has shown that a massage can lower your heart rate and blood pressure, relax your muscles and increase the production of your body's natural "feel good" chemical. Clinical studies show that even a single 1 ½-hour session can significantly lower your heart rate, cortisol levels and insulin levels all of which explain why massage therapy and stress relief go hand-in-hand.